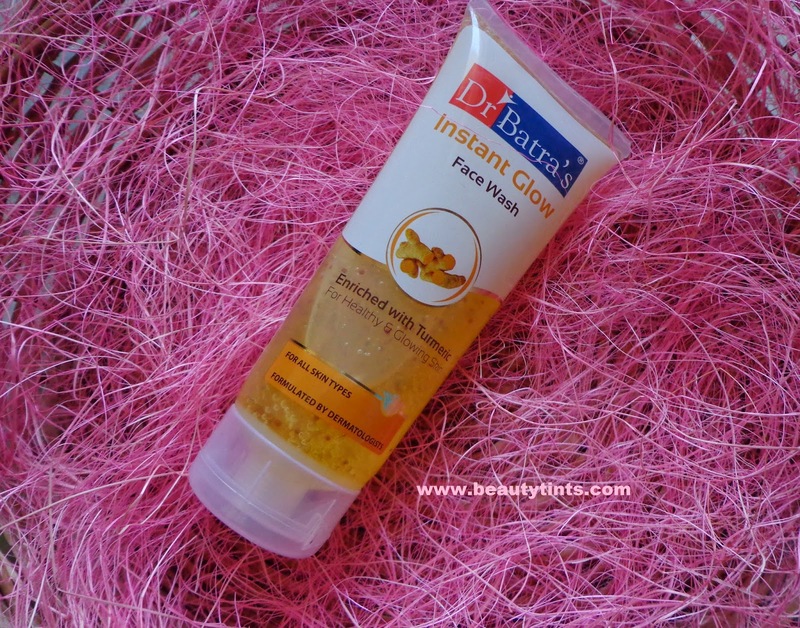 Recently Dr Batra's has launched a new range of face washes for every skin type in 3 variants like Acne Clear Face Wash, Moisturizing Face Wash and Instant glow face wash. Today, I am reviewing Instant Glow Face Wash,which is enriched with Turmeric,which has natural anti oxidant and anti-inflammatory properties. Packaging : It comes in an attractive transparent plastic tube packaging with a flip cap. 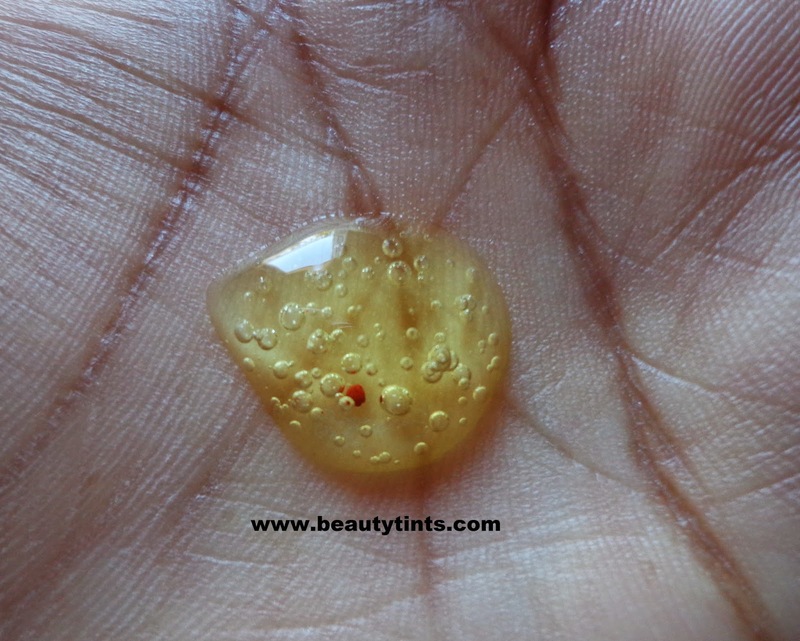 Color and Texture : This is a pale yellow colored gel kind of face wash with red colored micro beads. 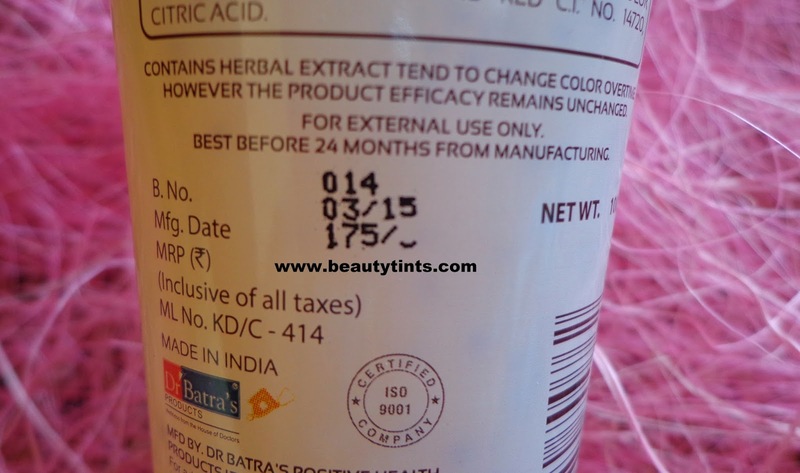 What the product Claims : This face wash is safe and skin friendly.It is enriched with Turmeric,which has natural anti oxidant and anti-inflammatory properties.Turmeric also has skin rejuvenating properties which help to repair facial skin damage caused by sun and other pollutants. 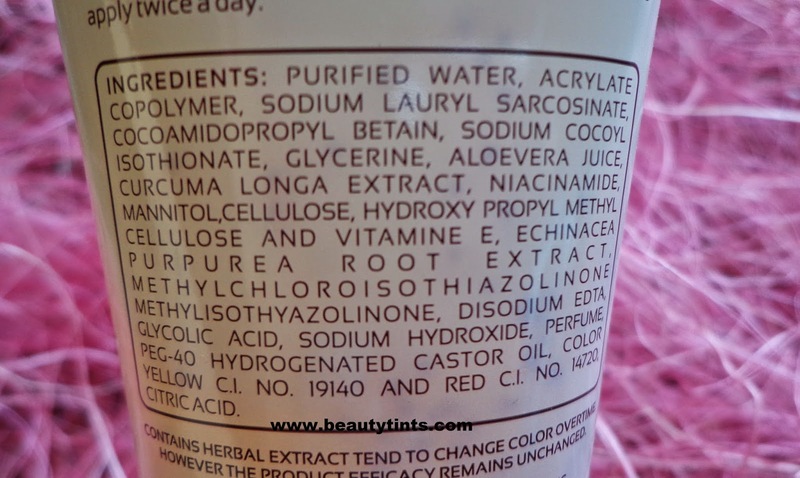 Ingredients : Purified water,Acrylate copolymer,Sodium Lauryl Sarcosinate,Cocoamidopropyl Betain,Sodium Cocoyl Isothionate,Glycerine,Aloe vera juice,Curcuma Longe Extract,Niacinamide,Mannitol,Cellulose,Hydroxy propyl methyl cellulose and Vitamin E,Echinacea Purpurea Root Extract,Methyl chloroisothiazolinone methylchloroisothiazoilinone,Di sodium EDTA,Glycolic Acid,Sodium Hydroxide,Perfume,PEG-40 Hydrogenated Castor Oil,Color Yellow C.I. No. 19140 and REd C.I. No.14720,Citric Acid. Directions for Use : Rinse your face with Luke warm water and apply Dr.Batra's Instant Glow Face wash on the face and work up a lather.Massage on face and neck in a circular motion.Wash off and pat dry.For best results apply twice a day. 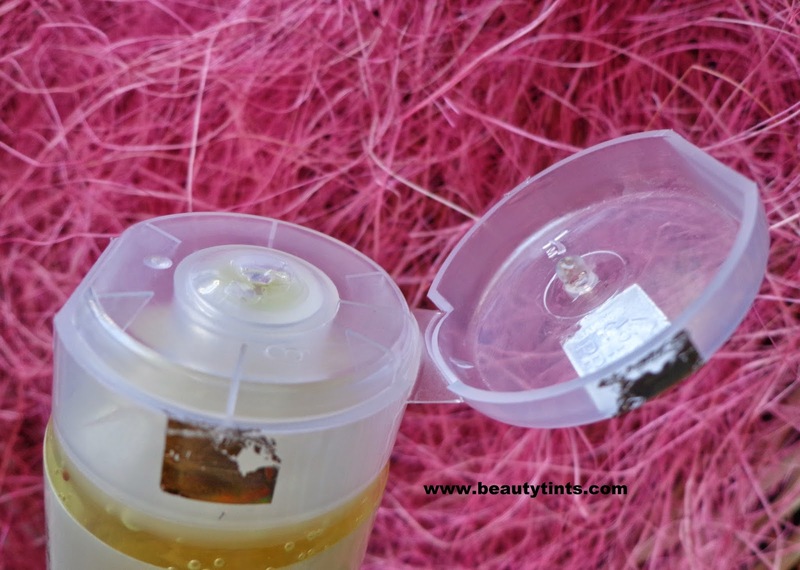 My Views On the Product : I have been using this face wash from past 1 week and I am loving it.This is a gel kind of face wash which has a very mild and mixed fragrance of turmeric and aloevera. As it is soap free and sulphate free,it lathers moderately.It cleanses the skin thoroughly and effectively remove all the accumulated dirt and grime from the pores making it visibly clean and radiant.It contains the goodness of turmeric,Vitamin E and aloevera.It neither dries out nor gives a stretchy feel after usage.As the name Instant Glow face wash suggests,it gives a nice glow instantly to the face and hydrates the skin well.It is very mild and gentle on the skin and suits all skin types.It also contains Glycolic acid which helps in peeling away the dead cells from the skin and thus helps in making the skin brighter and lighter.This face wash gets rinsed off easily with out leaving an residues behind.It is quite affordable for the quantity it comes and little goes a long way.So,easily one tube lasts for longer time making it much more affordable.It does not contain any harmful ingredients like parabens. A great face wash for all skin types. 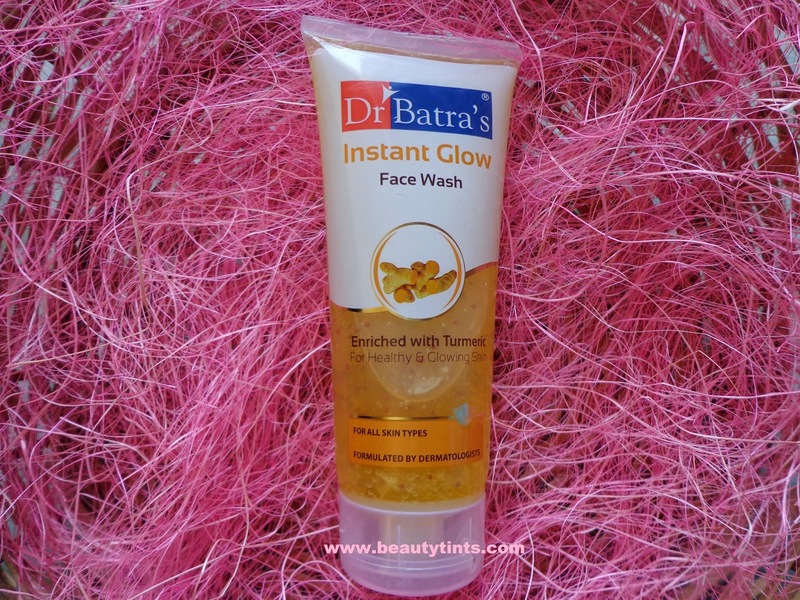 Final Conclusion about Dr Batra's Instant Glow Face Wash : A great face wash for all skin types.A must try for those who want a gentle yet effective face wash which gives a nice glow to the face with out drying out the skin.